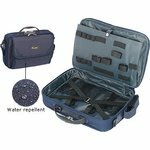 Multi-function bag with 4 inner layers. 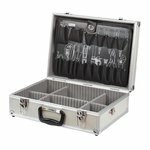 Ideal for storage of tools, books, mobile computers, clothes etc. 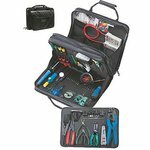 Multi-function tool bags can be used separately. 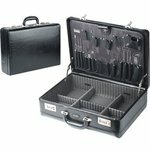 One tool case can be used for a tool kit, another one - for the documents. 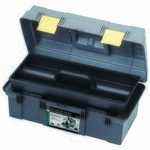 Reinforced construction with 3 hinges and corner protectors. Removable rugged pallet. Key lock. Material: aluminium (frame). 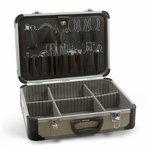 Capacious case for storing various instruments and equipment, made from ABS-plastic with aluminium frame. 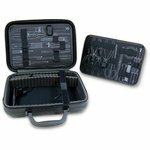 Very handy and convenient box with well-sized compartments and stands for various soldering instruments. Includes a special stand for soldering iron. PVL Leather; Size (LxWxH): 400x305x150 mm. 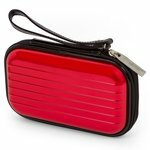 Plastic case with aluminium frame. Large corner bumpers to protect hardware. Key lock. 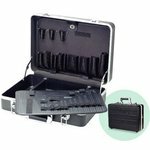 Reliable number key lock and 2 removeable rugged pallets allowing to store more instruments and keep them in order. 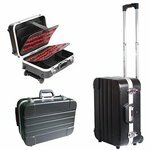 Case with 2 pallets for holding various electronic appliances. 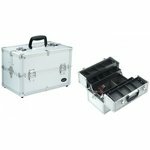 Aluminum frame tool case (440×340×165 mm) with locks. 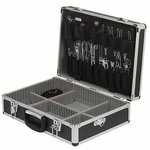 Handy and convenient case for holding tools and various electronic appliances, with removable tray. 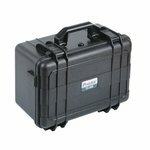 Durable waterproof tool case made of ABS for carrying heavy equipment (hand tools, measuring equipment). 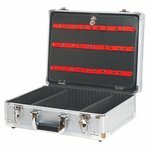 A case made of ABS plastic with a sturdy aluminum frame construction. 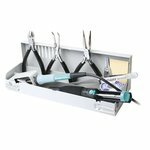 Ensures tool protection and comfortable transportation. 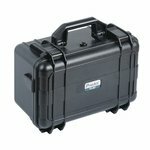 Durable waterproof tool case made of ABS for carrying heavy equipment. 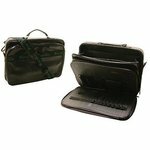 Portable Hard Shell Case made of durable PET. Size: 175 × 105 × 40 mm. Reinforcing aluminium frame and corner protectors. 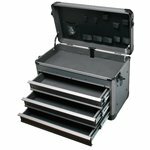 Removeable rugged pallet for storing more instruments. Reliable key lock and 3 hinges. 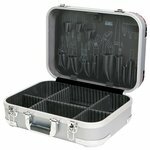 Carrying tool case with drawers made of rugged plastic with aluminum frame.